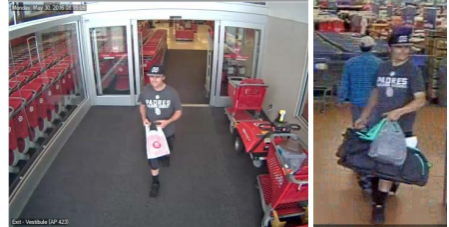 San Diego County Crime Stoppers and investigators from the North Coastal Sheriff’s Station Friday are asking for the public’s help to identify a man and a woman wanted for using a stolen credit card and a car burglary. The car burglary happened sometime between May 29 and May 30. A wallet,containing cash and credit cards, was taken from an unlocked car parked in a private driveway in the 100 block of Little Orphan Alley in Del Mar. The loss is estimated at more than $6,600. The victim’s credit cards were used on May 30th at several stores, including Wal-Mart and Target. 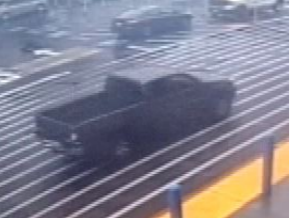 The suspects were captured by surveillance cameras at the Wal-Mart store in Kearny Mesa where they used one of the stolen credit cards to purchase various items, including a luggage set and handbags. The suspects also purchased prepaid debit and gift cards at the stores. The first suspect is described as a Hispanic male standing between 6′ and 6’2” tall and weighing about 180 pounds with dark hair. weighing between 165 and 175 pounds with light brown hair. Anyone with information on this case should call the North Coastal Sheriff’s Station at (760) 966-3500 or the Crime Stoppers anonymous tip line at (888) 580-8477.